An Ama with the day’s catch in Toba. Ellen Kaplowitz photo. To refer to them as “the mermaids of Japan” is to do them a disservice, as they are far more valuable than their mythical counterparts. 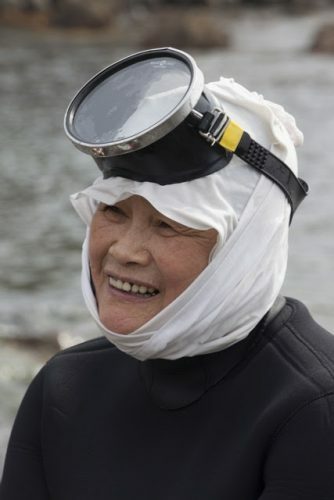 Japan’s Ama are famous women throughout the country for their cold water diving. 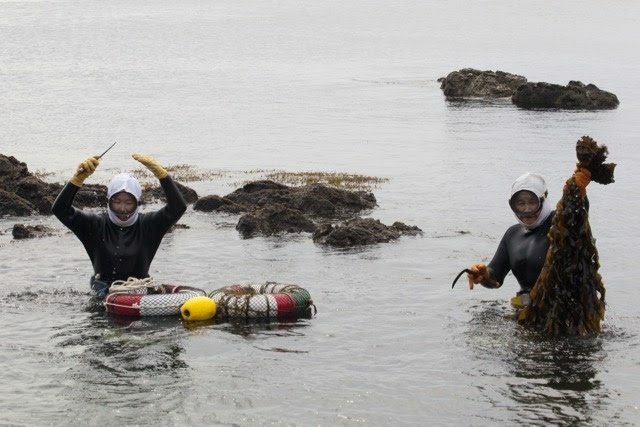 The ama, or women free divers of Japan, may have seen their numbers dwindle from a peak of over 10,000 to under 2000 today but those that remain in this challenging and at times life-threatening occupation wouldn’t choose to do anything else. I first visited Toba in the fall of 2016 with Yuko, a Japanese friend from Osaka who knew the area well. Along with a friendly Canadian called Chris who’d long lived there, we spent several days exploring the region, including a couple of nearby islands. Always curious to learn as much as possible about the places I go, I spent some time reading up on the local history, focusing on the ama with whom I’ve long had a fascination. Written accounts of the divers date back over two millennia, to the story of a young amasan who presented a princess with an abalone to give to the Sun God. 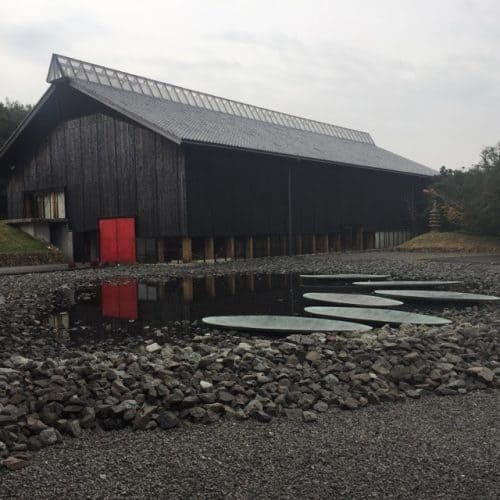 Legend has it that he found the abalone so delicious he chose Ise as his home, and even today there is an annual tribute of abalone presented at the Grand Ise Shrine. The area around Toba, the main city in the region, is home to over half the amasan population, scattered over the area and the nearby islands of T?shijima and Kamishima. 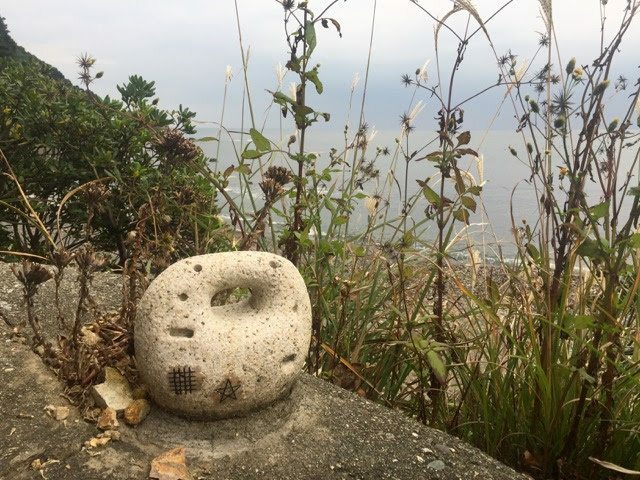 As regulations have increased in response to decreasing numbers of abalone and urchin, amasan nowadays will often have a second stream of income such as vegetable farming, tofu or nori making, running cafes or small inns, and in a few cases, tour guiding. The divers have historically been women due to their extra layer of subcutaneous fat (it does come in handy for some things), lung capacity, and tolerance for working in difficult conditions. For most of their long history, the ama wore simple loincloths (a large part of what earned them their “mermaid” moniker). That changed in the 1960’s when wetsuits became easily accessible and also allowed them to dive in colder weather. In general, divers fall into two categories: those with husbands who work as a team and make deeper dives from small boats, and single divers who stay closer to shore and rely on floating baskets to hold their catch. Ama typically dive two to three hours a day, six days a week, between March and December. Dives last between 20-60 seconds on average, though most Ama can hold their breath twice as long if necessary. Ama dive well into their 70’s, and even 80 isn’t unheard of. After all, they say to impressed visitors, what else would they do? Ama grilling shellfish in an amagoya. Lauren Scharf photos. Traditionally, the husbands of the ama have had it pretty good. Their responsibilities include running and maintaining the skiff, pulling up their wives when signaled, and handing out towels once the women are back on board. Beyond that, they have a well-earned reputation for doing as little as possible while their wives take care of home and business. But to be fair, a good number of husbands now are fishermen themselves, dividing their time between assisting their wives and their own fishing concerns. Between them, it’s still possible to make a good living from the sea. Ama today dive for abalone, sea urchin, turban shells, sea cucumber, and certain types of seaweed, but once upon a time, oysters also played a significant role. Not for eating, but for the far more lucrative cultured pearls. Mikimoto pearls, arguably the most famous in the world, started in Toba in the 19th century and in the early days the ama were employed to first bring up the oysters for seeding, then to return them to the seafloor where the pearls formed. They were also tasked with protecting the seeded oysters from red tides and typhoons, diving down to collect and relocate the treasures in times of trouble. Today, divers are no longer used, but at Mikimoto Pearl Island in Toba, visitors can watch a live demonstration with authentic ama, including the eerie isobue or sea whistle, a particular method of breathing designed to protect the Ama’s lungs upon resurfacing. We got front row seats in a special inside area for foreign visitors, complete with English translation and huge open windows right over the sea. I thought it would be cheesy but in fact, it was very interesting to watch and I can still hear the isobue in my head! 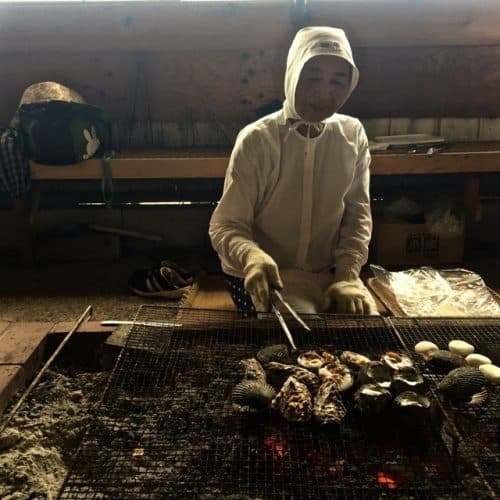 We had lunch at a traditional amagoya or ama’s hut, where two ama grilled up the day’s catch over a bed of hot coals and were happy to regale us with tales of their watery endeavors. I’d read a bit about the two symbols seen all over the place and one of the amasan was happy to explain in detail. Due to the inherent danger in their work, ama are a superstitious and comparatively religious lot, relying on regular prayers to both Shinto shrines and Buddhist temples and talismanic symbols. Traditional ama weight with symbols. The most common are the seiman, a 5-point star drawn with one line to symbolize returning safely to one’s starting place, and the douman, a grid of four horizontal and five vertical lines intended to protect from external evils. These marks are seen on the amasan’s head towels, weights, and randomly throughout their villages. 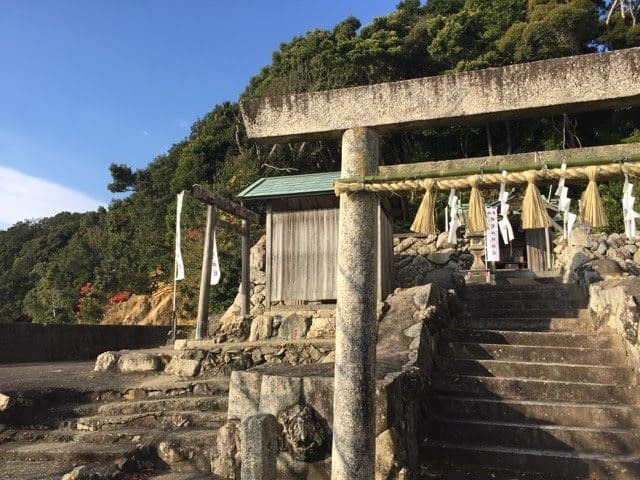 The most visited shrine is Shinmei Jinja, home to Ishigamisan, a Shinto goddess who has the power to grant one wish to each woman who comes to pray. Amasan are not the only women to visit this beloved deity; she sees thousands of single women bearing coins and bowing their lonely heads every year. Not in the market, Yuko and I passed on the opportunity but many other female visitors made it a point to stop by. Chris wanted to show off the wonderful Sea-Folk Museum dedicated to the world of the ama and the region’s long history of fishing. Full of dioramas, photos, and actual fishing and diving equipment, there’s plenty to see and touch. In the afternoon, a short ferry ride brought us to T?shijima Island where many ama make their homes. 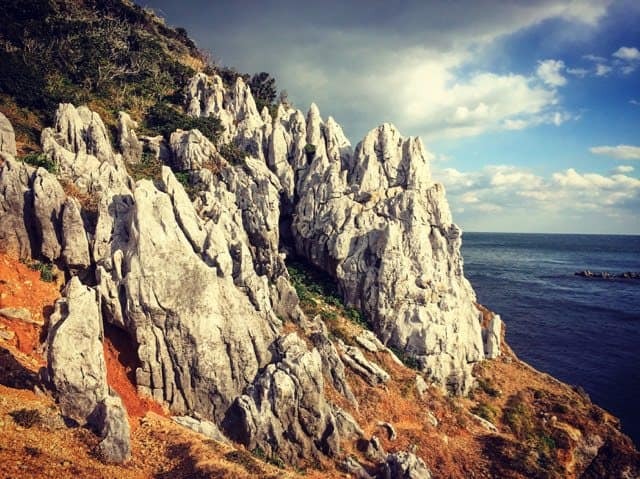 Limestone karsts on Kamishima Island. We had the chance to experience an authentic Shinto ritual at a local shrine followed by coffee and conversation with the priest and his wife, then arrived at the port just in time to see the fish auction held daily at 12:30 pm. Watching the group of men moving up and down the aisles between the tanks, the auctioneer calling, the bids flying, was definitely a highlight of the trip. Dinner was at what appeared to be an unremarkable sushi joint where we ended up having one of the most amazing meals I’ve had in Japan. Everything was fresh to the point of alive, including the Ise Ebi or rock lobster for which the area is famous. The next morning we took another ferry across to tiny Kamishima, another island in the bay. It takes just 2.5 hours to hike completely around the perimeter, with plenty of ups and downs to keep it interesting. We passed a couple of shrines, the lighthouse, the school, and an old concrete structure that was once a lookout point during WWII and later the scene in a book and film by Mishima. All in all, we enjoyed our time in and around Toba. Meeting the ama, learning about their way of life, exploring the local islands, and enjoying the delicious regional foods all made our trip unforgettable. I’m already planning my next trip to coincide with abalone season! Lauren Scharf lives in Japan where she is a consultant in the travel industry. Prior to Japan, she lived in Alaska and Nicaragua, teaching English, fishing for salmon, and running a small NPO.